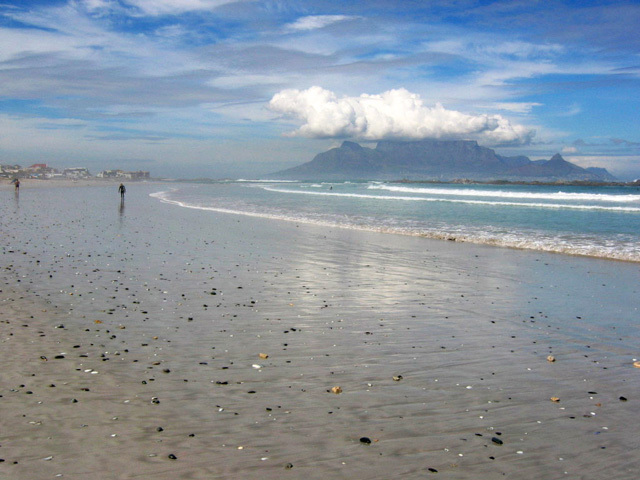 Big Bay is one of two Bloubergstrand beaches – the other is unsurprisingly called Little Bay (or Small Bay) – and is a favourite surfing, windsurfing and kitesurfing spot, drawing international enthusiasts to annual competitions. Not only is it a great fun family beach, the long, flat sandy Big Bay Beach is perfect for sun tanning, walking, flying kites and just vegging out. If you can cope with ultra chilly water the swimming and bodysurfing is safe and fun. 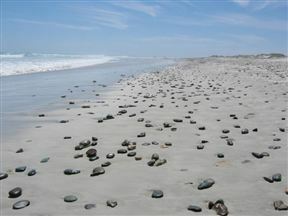 A rocky point divides the descriptively named Big Bay and Little Bay Beaches of Blouberg. There’s a plethora of shops and eateries along the beachfront road. Ever wondered which one of Cape Town Beaches is best for taking photos of Table Mountain and the sea? Well, Blouberg (Blue Mountain) is the spot from which the postcard images are taken. Don’t miss the awesome sunset views – watch the face of Table Mountain turn golden as the setting sun blazes across the Atlantic Ocean. Big Bay Beach is 4.6km from the centre of Blouberg , the nearest airport 25.1km (Cape Town International Airport).